The Anime Shorts programme at Scotland Loves Anime involved the screening of 2 films – Tokyo Marble Chocolate and Mass Effect: Paragon Lost. Calling this screening ‘Anime Shorts’ may have been a misnomer as Mass Effect clocked in at about 90 minutes and Tokyo Marble Chocolate itself was two films, making it seem like a longer work. Both these animations were developed by Production I.G whose previous work includes Ghost in h Shell and Blood The Last Vampire. Tokyo Marble Chocolate was a quirky love story separated into two perspectives of the same story. One point of view was from the female character Chizuru and the other the male character – Yuudai. Yuudai has problems expressing his feelings for Chizuru and decides to buy her a pet as a present. 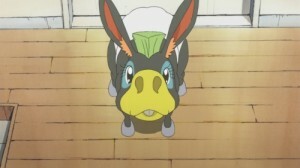 This present has consequences as Yuudai is mistakenly given a donkey by the pet store owner. This is no ordinary Donkey, he looks like a punk and causes havoc. Tokyo Marble Chocolate was definitely the superior of the two shorts on offer, with the traditional love story presented in a welcoming and colourful style. The tone of the anime is similar to Jean-Pierre Jeunet’s popular French film Amelie and the fact that we seen the same story twice (from two different perspectives) only adds to the charm. It is a typical love story told in loving tone. Mass Effect on the other hand was nowhere near as an entertaining. Based on a popular video game, it soon became apparent that the viewer will have had to have played the game to fully appreciate the anime. 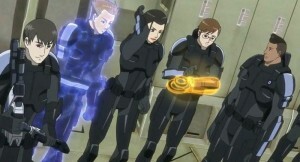 Mass Effect was created for a western audience – the English dub being the original, as opposed to the Japanese version and this is rare in anime. The problem with the animation however was the pointless violence, clichéd story, badly acted dialogue and generic character designs. Mass Effect was definitely a forgettable film with a story that had no lasting appeal. For fans of the game only.